Since March 7, 1967, when it opened Off-Broadway at Theatre 80 St. Marks, You’re a Good Man, Charlie Brown has become the most produced musical in history. Millions of theatergoers world-wide have reveled in this funny, wise and altogether human musical based on Charles Schulz’s beloved comic strip PeanutsTM. 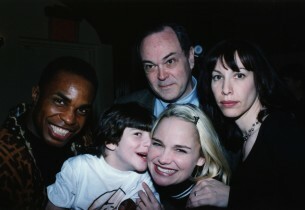 The show began a new chapter in its extraordinary life when an expanded Broadway revival opened at the Ambassador Theatre on February 4, 1999. The original idea began simply enough when, in 1966, then-fledgling producers Arthur Whitelaw and Gene Persson asked Clark Gesner to turn his album of PeanutsTM character songs into a show, using the actual comic strips for the book. The results were immediate and smashing. The original Off-Broadway production directed by Joseph Hardy spawned literally thousands of productions in the U.S. and around the world. Because of the simplicity of the original production – six actors and a few modular blocks as a set – You’re A Good Man, Charlie Brown became enormously popular for high school, stock and amateur groups. 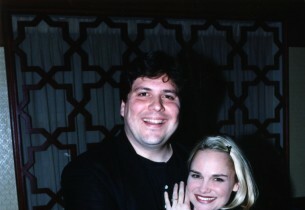 More than thirty years after its original production, producer Michael Leavitt of Fox Theatricals believed the show had an even greater potential to be a contemporary Broadway hit. Much of the show’s charm and humor is timeless, and any musical that produces genuine laughter and joy is a rarity these days. The continued world-wide love of Charles Schulz’s comic strip PeanutsTM – Soon to celebrate its fiftieth anniversary – transcends popular culture. The trials and tribulations of Charlie Brown and his gang are firmly embedded in the lives and experiences of two generations. Leavitt knew the key to the success of a new would be to find a director who could reconceive the show with taste, style and a sense of humor that contemporary audiences would enjoy. Michael Mayer, the young, highly-lauded Tony®-nominated director (who at the time had three highly praised dramas running in New York), was perhaps not the obvious choice for a musical revival. However, when Leavitt asked him, “What would you think of directing You’re a Good Man, Charlie Brown?” Mayer took less than a minute to say “Of course. Yes.” As an undergraduate, Mayer had played Schroeder. He remembers experiencing “the amazing way people of all ages, backgrounds and types responded with their hearts to this incredible world inhabited by these six characters.” What Mayer and Leavitt recognized was Schulz’s genius for creating characters who are not just children. They are universal personality types with adult sensibilities. A sophisticated and hilarious collection of observations on human behavior, the show is deceptive in its simplicity. As we begin a new century, Mayer thought, “what better time to give You’re a Good Man, Charlie Brown a new life?” With the support of Leavitt, co-producer Jerry Frankel, Whitelaw, Persson and Gesner, Mayer went to work. Understanding that the original production was imbued with a style (and some references) that belonged to the late 1960s, Mayer was determined to preserve those elements of the PeanutsTM characters that are timeless, to discover new opportunities for them, and to give his production a bold, contemporary Broadway style. All this, he believed, must be accomplished while never losing the simplicity, warmth and wisdom of the original. Once he had his vision for the show, Mayer traveled to Santa Rosa, California, to visit with PeanutsTM creator, Charles Schulz. By the end of their time together, Schulz not only supported the ideas Mayer had proposed, but offered him a monumental gift: access to the thirty-two years of PeanutsTM strips created since the show’s original version. Mayer’s transformation of You’re a Good Man, Charlie Brown was thorough. Songs and scenes were revised and re-ordered. Seventeen of the show’s original forty-two scenes were deleted, and twenty-one new ones were added. He invited up-and-coming composer-lyricist Andrew Lippa to revise, seven of the original numbers with new vocal and dance arrangements, write two new songs, and reconceive the opening number. In an inspired change, Mayer replaced the amorphous character Patty of the original version with Charlie Brown’s younger sister Sally, opening up the show to a wealth of terrific material. From there, he brought together a first-rate Broadway creative team. Scenic designer David Gallo, costume designer Michael Krass and lighting designer Kenneth Posner create an imaginative stage world that is faithful to Schulz’s style and full of eye-popping color and effects. Michael Gibson’s orchestrations and Andrew Lippa’s vocal arrangements give Clark Gesner’s enchanting score a vivid new sound, which this recording (wonderfully produced by Lippa) celebrates. Choreographer Jerry Mitchell created movement and dances that are “Broadway” in spirit, childlike in style. Finally, Mayer assembled a fabulously talented, multicultural cast that almost magically embodies the essence of Schulz’s renowned characters. 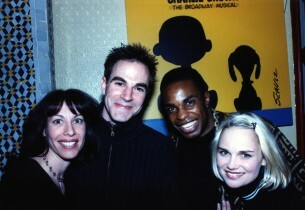 Roger Bart’s delicious and winning Snoopy is smart, wise-cracking, joyous. Kristin Chenoweth splendidly captures the absurdly intense angst and confusion of Sally. Ilana Levine is a fiercely contemporary Lucy, boldly dispensing advice, commands, and “little-known facts.” With gentleness and sincerity, Stanley Wayne Mathis celebrates Schroeder’s profound love and reverence for music – when he’s not dodging Lucy’s advances. B.D. Wong is a wise and thoughtful Linus, an acutely sensitive boy whose brains and warmth are equaled only by his blanket dependency. Finally, there is Anthony Rapp, sublime and genuine as Charlie Brown, the round-headed kid trying to figure out what being a “good man” means. Like each of us every day, he attempts to figure out who he is, why he is here, and how he fits in. As the millennium approaches, Charlie Brown continues to be, as he was fifty years ago, the quintessential Everyman. At the end of the musical, Charlie Brown and friends sing “Happiness.” For audiences at the Ambassador Theatre, it is an enormously moving conclusion. This extraordinary production has taken them on a journey that, like the comic strip, is funny and wise in its articulation but astonishingly compelling in its effect. The final lyric is “Happiness is anyone and anything at all that’s loved by you,” a simple idea that, like this marvelous new production, surprises you with its power, wisdom and joy. 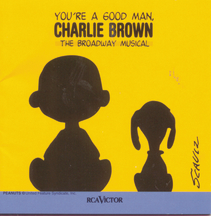 Charles Schultz’s beloved PeanutsTM comic strip became a musical in 1967, when Clark Gesner presented his You’re a Good Man, Charlie Brown at the off Broadway Theatre 80 St. Marks, where it ran for more than four years. Thirty-two years later, on February 4, 1999, it finally made it to Broadway, in a spanking new production at the Ambassador Theatre directed by Michael Mayer, and choreographed by Jerry Mitchell. In its cast were Roger Bart, Ilana Levine, Stanley Wayne Mathis, Anthony Rapp, B.D. Wong, and Kristin Chenoweth as Sally, who stole every scene in which she appeared. Though its run was considerably shorter than its off Broadway counterpart, it had a 150-performance stretch, not bad for a 32-year-old comic strip brat.